This dress for example – it’s quite a bold all over print, and usually something I’d be self conscious about wearing, but I’m absolutely smitten with it and it makes me feel like I’m heading to some kind of seventies beach resort. 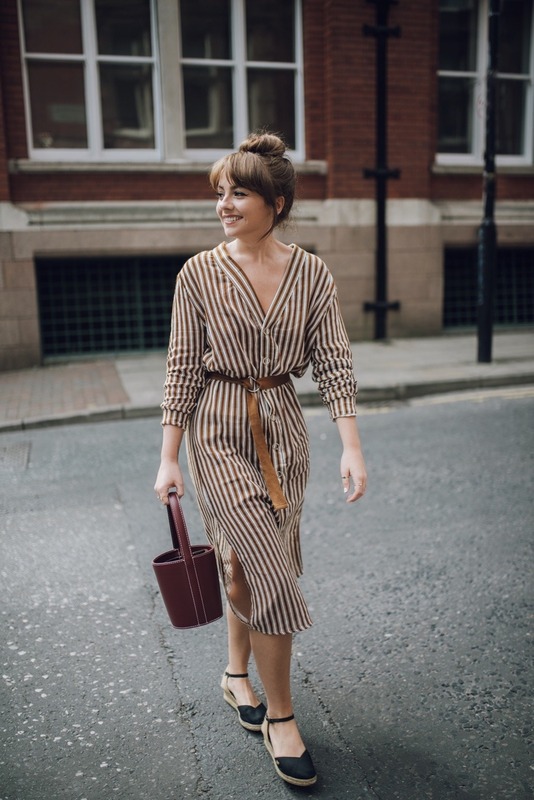 I love the brown stripe pattern – it has a real vintage feel to it, and has proven to be the perfect sunny weekend strolling attire. I love that I can play around with the buttons and shape of the dress too – you can wear it slightly off the shoulders, or slouched just off the one shoulder, I can even undo some of the lower buttons for a bit more leg action if I’m feeling adventurous. It’s just one of those pieces that I feel great in, and I don’t think it will ever really go out of style. 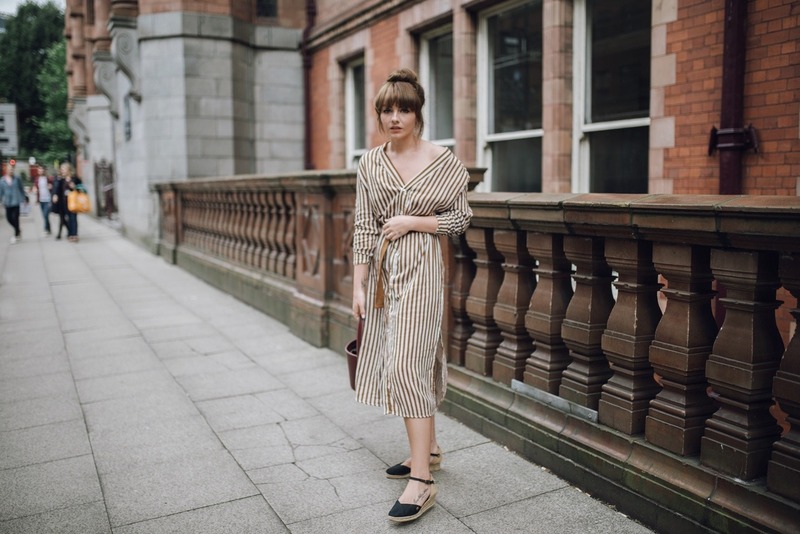 I’m really into minimal striped dresses – I just think they are endlessly classic and tend to suit everyone. The only thing to note about this dress is that it’s very oversized (I have the small for reference), and could probably have gone for the extra small for a bit more of a tailored fit. I kindly received a package recently that had a few Moon River items inside – an L.A based brand that I had never heard of up until now. I was pretty surprised to find that I loved each and every piece – I love that new feeling of excitement when you discover a brand that makes clothing that expresses exactly how you want to dress. If you follow me over on Instagram then you might have noticed a few other pieces that I’ve been wearing by them, including some dreamy striped shorts. It’s safe to say the pieces I received have given my wardrobe a much needed refresh, and definitely have me excited for the months ahead. As much as I love summer, I’m definitely ready for the seasonal change in fashion – my style very much relies on layering, meaning I always feel most myself during the Autumn months. I think this dress will serve me well for the last of the summer evenings where I want to feel put together, but a little more covered up – I’m also really excited to wear the striped shorts with some tights, pointed boots, and a beloved turtle neck. Oh wow, this is a completely new designer to me, thank you for presenting it! This is such an amazing shirt dress!